Our customer service goes well beyond selling you a mobility scooter. When you purchase from us, we’re here to support you for as long as you own an Active Scooter. Mobility scooter servicing can help prevent long-term wear, providing you with years of reliability, freedom and independence. Ideally, you should have your mobility scooter serviced once a year to ensure that the brakes, batteries, motor and steering are performing safely. If you regularly take your scooter off-road, we might need to take a closer look at the tyres, wheel bearings and suspension. There is also no need to come to us, we’ll come to you. 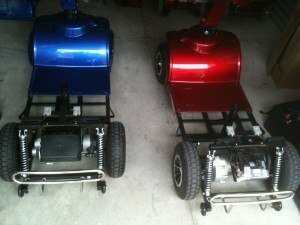 If you live anywhere in Brisbane, Sunshine Coast, Gold Coast or Ipswich, just call us and we’ll schedule a time that’s convenient for you to receive your mobility scooter servicing. We’ll bring our own mobile workshop to maintain your scooter. Need a spare part? No problem. We have stocks in Brisbane and Melbourne, so we can get the part you need quickly. If it’s not quick enough, we’ll give you a free rental scooter. We’re ready to do whatever we can to help you regain your independence and freedom. From mobility scooter servicing to easy-to-transport scooter racks, you’ll find everything you need to enjoy greater mobility through Active Scooters. Would you like your scooter serviced?